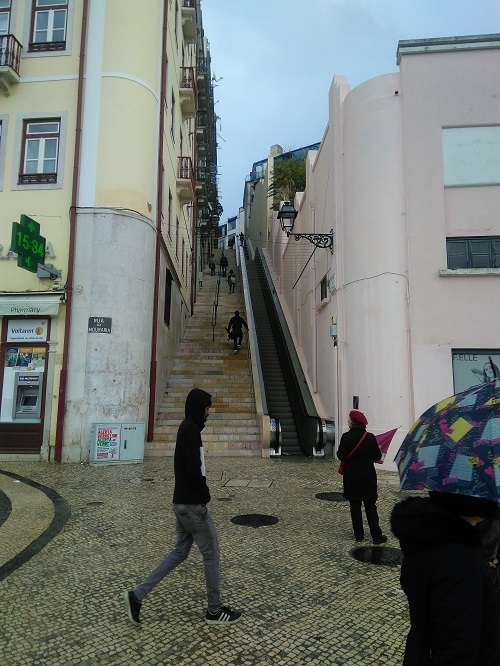 It passes the Saint George’s (São Jorge) castle , one of the main historical touristic sites of Lisbon, the famous viewpoint (miradouro) Portas do Sol (Gates to the sun) and the legendary fleamarket ‘Feira da Ladra’ in Alfama, Graça, Mouraria, Bairro Alto, (Lisbon’s bohemien haunt of artists and writers, and posssibly one of the best spots in Europe for a night out). Last stop: Cemetery ‘Prazeres’ (Cemetery of ‘Pleasures’), really worth a visit! 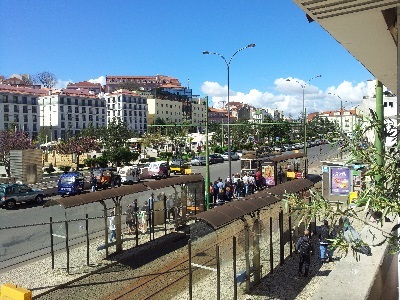 Square Praça Martim Moniz & long lines of people waiting…. 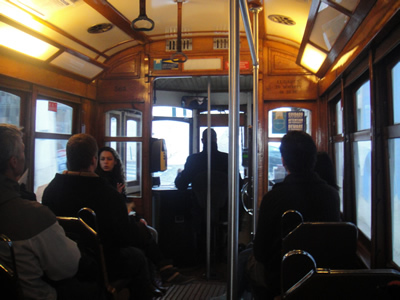 Tram 28 is very popular with tourists & prime pickpocket territory! Take care! Leave your bag in the hotel/apartment, just take some money with you in your pocket ! 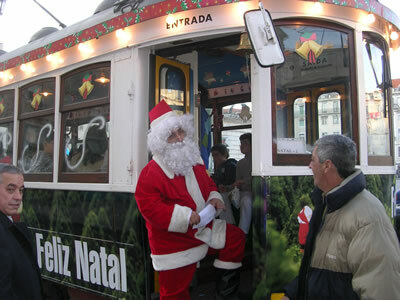 Buy the 24-hour ticket that will allow you to hop on and off whenever you want on all trams, buses, and subway lines. 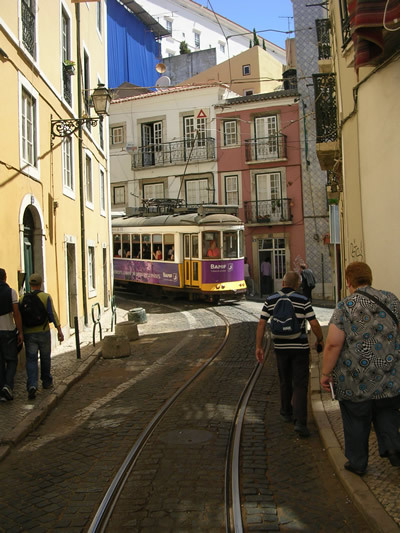 The number of tourists has been increased since a few years, which means that tram 28 route is mostly fully packed. 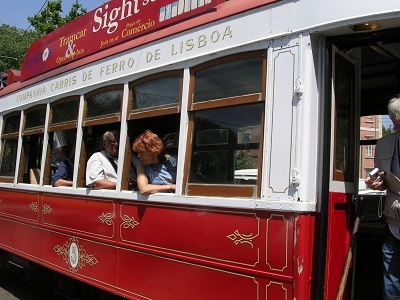 The RED TRAM is the official sightseeing tram, which covers the same neighborhoods, a ticket is more expensive, but you’re always guaranteed to have a seat. There ‘s English and Portuguese tour commentary without the need for headsets. 10 minutes walk from starting point tram 28 my there’s my 3 bedroom (100 m2) apartment (short term rental) in historical area Mouraria with a 30m2 and very quiet lovely patio. 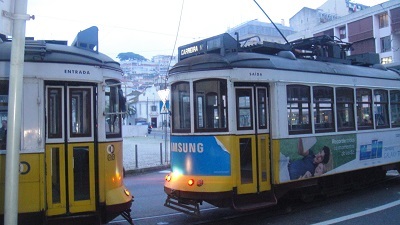 Alfama. 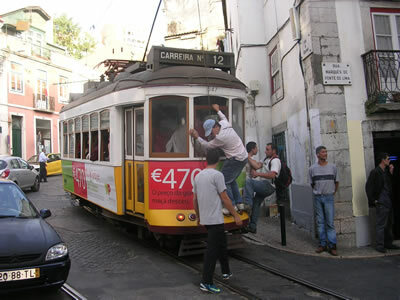 Tram 28 is increasingly as popular with pickpockets as it is with tourists. 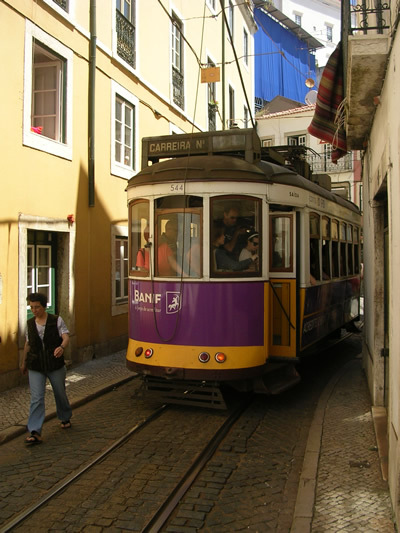 Pingback: Safety in Lisbon: watch out for pickpockets! 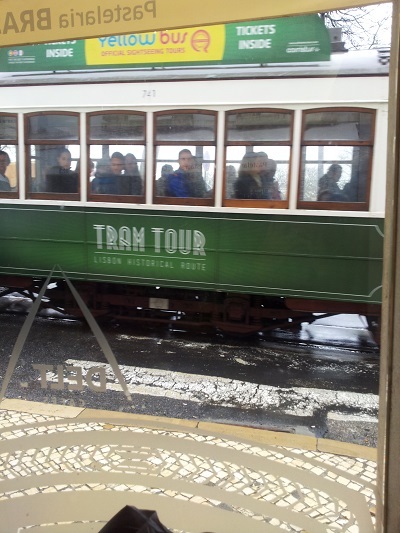 Nice photographs of Tram 28 going in between all the buildings. Don’t forget to put your wallet in the safest place like a belly pocket. We were alleviated twice and have lost money, credit cards, driving licence and key because of being recognised as tourist (we had a big bag with us). So beware of pickpockets, it really happens daily. And if it occurs to you, go to the police at Restaudadores, but dont expect more than a nodding and a sheet of paper. The police does not do anything against these thefts! 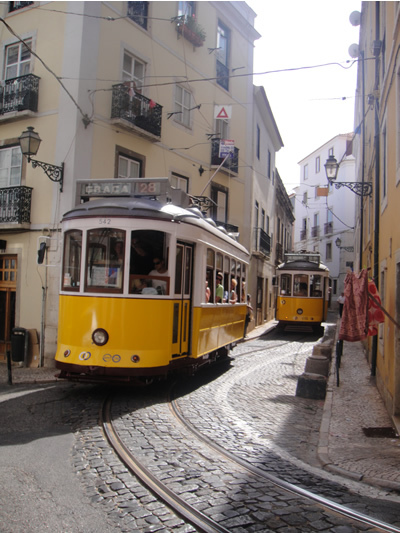 You should also know that the 28 also has a shorter route, going only between the Estrela basilica and the neighborhood of Graça. 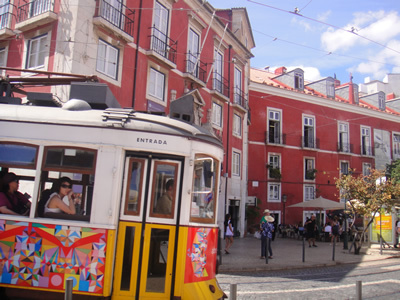 Sono rimasto incantato di Lisbona,dopo esserci stato per ben due volte per incontrare mia figlia Carla che ha vissuto per sei mesi nella vs. bellissima città, al ritorno, sull’autobus che ci portava all’aeroporto, piangeva. 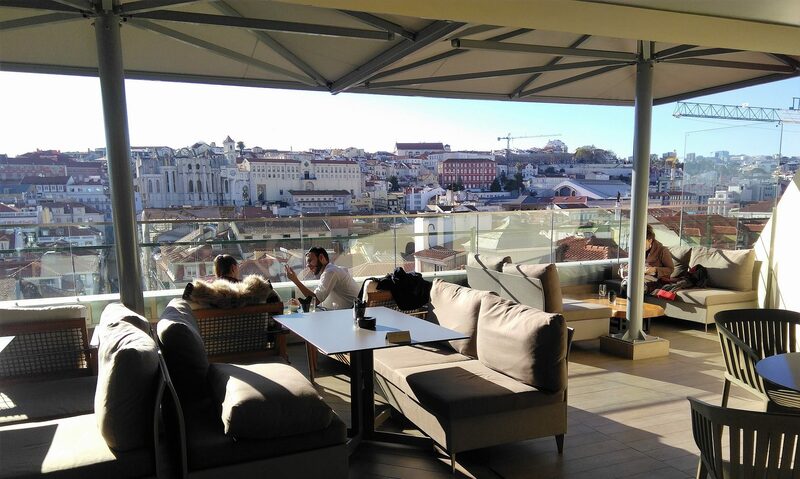 E’ nei miei sogni potermi un giorno trasferire nella vs. incantevole Lisbona. Think carefully before you getting on this tram. It is notorious for pickpockets, and the advice for tourists is do not use it. I had my purse stollen within 2 minutes of getting on the tram.